Organizing your space makes the whole home more relaxing, inviting, and better to live in. Working in an organized space allows you to be more productive, better manage tasks, and reduce the number of things you lose. All that is great, but it also tends to be easier said than done. Keeping your workspace organized, especially if you’ve let it get really untidy, can be quite intimidating! 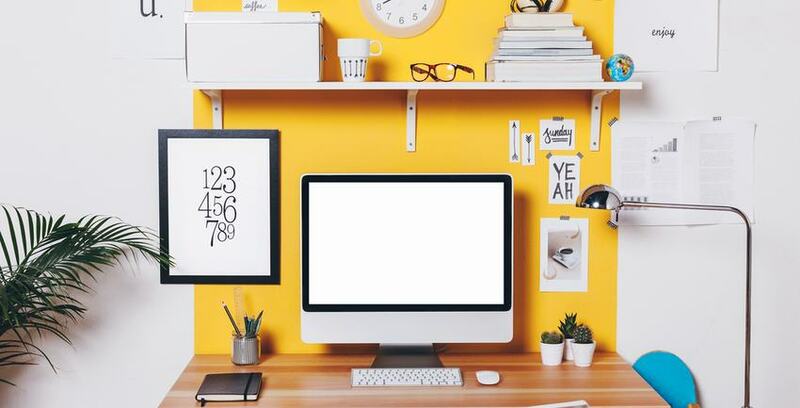 That’s why we've gathered this list of the top eight tips for organizing your home office. We're not talking about straight-up trash here; we're talking about the sort of garbage that’s more likely to pile up in drawers. This includes: pens that are out of ink, bent paper clips, old magazines, documents you don’t need, empty packaging, etc. It's easy to pretend the ever-growing nest of tangled wires that exist underneath most home desks. Not only is this an organization eyesore, it's also a tripping and fire hazard. Transitioning from cabled to wireless devices is a good first step to take. After that, we recommend using organizational tools like ties, clamps, or wraps to straighten out wires and keep them from tangling. For the papers you file instead of throw away, we recommend color-coded file folders. You can use whatever variety of color-to-topic conversion that works for you. Try color coding by topic: things like green for financial, blue for medical, red for personal, etc. You’d be surprised how much a simple move like this could help. Don't hesitate to use wall space. If your desktop is especially cluttered, consider using the wall. To replace a desktop planner, you can use a wall-mounted whiteboard calendar. You can hang small shelves for the little things that tend to make space feel more congested. Going vertical always helps with organization. Don't forget to organize digitally as well. Use labeled filing systems on your desktop, clear out old files, and backup the files you regularly lose. That way they won’t get lost permanently if anything happens to your hardware. Place -like items together in organized bins or boxes. Keep a small box for all your sticky notes and stickers, another for all your writing tools, one more for tools like a stapler and hole puncher, and so on. It's a lot easier to organize your home office when you take care of clear out the excess paper. The easiest way to handle your office paper is to consider one of three fates for every piece you look at: shred, file, or take action, then shred or file. Once you’ve put together small boxes, bins, or containers for your different items, take the next step and label those boxes. A label maker can come in handy outside of your home office as well.It's an investment in organization for your entire home, not just one room. Keeping organized is all about the right peace of mind. Whenever you need a little peace of mind regarding your home’s organization, don’t hesitate to call the experts at Storage Direct to see how we can help.